Make sure you bring your dancing shoes tonight when Soul Power blows into the Freight! 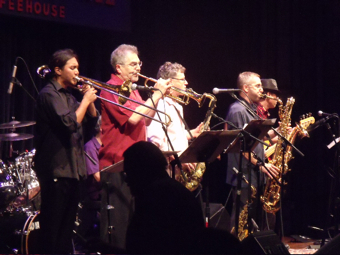 Blending the sophisticated stylings of the amazing Eastside Horns with a funky East Bay rhythm section, and fronted by the soulful vocals of Louisiana Bayou native Tommy Banks, this nine-piece band invites one and all to get their groove on with riveting solos and an unstoppable dance groove. Churning out dance tunes that hearken back to Tower of Power, Average White Band, Earth, Wind & Fire, and James Brown, the band includes finger popping funky bassist Scott Willson and his brother Ian Willson on tenor sax, with trumpeter Glenn Appell, Robert Todd on baritone sax, Patrick Malabuyo on trombone, guitarist Peter Fujii, Rick Bailey on drums, and Loren Linnard on keyboard.